Treefort Music Fest gets underway tonight in Boise. Local rock band Finn Riggins will kick off the second annual festival and bands will play into the early morning hours. The four day event will bring indie and emerging bands to a dozen venues in downtown. This year's Treefort Music Fest can be summed up in one word, more. Some 200 plus indie and emerging artists will perform during the four day festival. Frankie Barnhill has been covering the lead-up to Treefort, and she talked with Scott Graf about why Treefort is becoming a big deal for the Idaho music scene. Morning Edition Host Scott Graf talks with reporter Frankie Barnhill about Treefort Music Fest. "As festival director Eric Gilbert explained it to me recently, it’s Boise’s chance to play host to some of the coolest bands around," explains Barnhill. "Treefort comes right on the heels of South By Southwest (SXSW), a much bigger music festival that wrapped up in Austin, Texas, last weekend. Some of the bands that played at SXSW are making their way to Boise this week. Scott Graf: For someone who doesn’t know much about the music scene, why should I care about Treefort? Frankie Barnhill: Come on Scott, don’t you want to be as hip as all the hipsters? Scott Graf: Frankie, the words "Hip" and me don't really go together. Frankie Barnhill: This is only the second year for the fledgling festival, but momentum has really picked up. 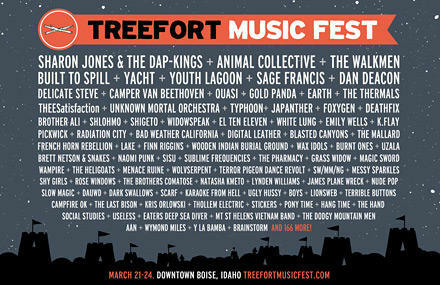 Treefort has received endorsements from the Idaho Tourism Division and the city of Boise. Mayor Dave Bieter even made a cameo appearance in a promotional video last month! Frankie Barnhill: But perhaps the most important thing about Treefort is its potential to put Boise on the map as a destination for bands passing through the Northwest. It’s also helping to highlight hometown talent that’s been blasted on the national scene – acts like Youth Lagoon and Built to Spill both will play the festival. Last year Treefort received coverage from national music media like Rolling Stone and Paste Magazine, and organizers are expecting even more attention this year. Scott Graf: So what can we expect in the second year? Frankie Barnhill: In a word, more. More bands, more venues, more decisions to be made by festival goers. 260 plus musical acts will perform this year, and three headliners will play the mainstage. But the growth is a managed growth. The organizers have been mindful about creating a weekend that offers lots of musical options for attendees, while still not being overwhelming in the way SXSW can be. In fact, festival director Eric Gilbert would like to distance the comparison with the Austin music extravaganza. Frankie Barnhill: To be fair, Treefort does have a few corporate sponsors, including Whole Foods and Alaska Airlines. 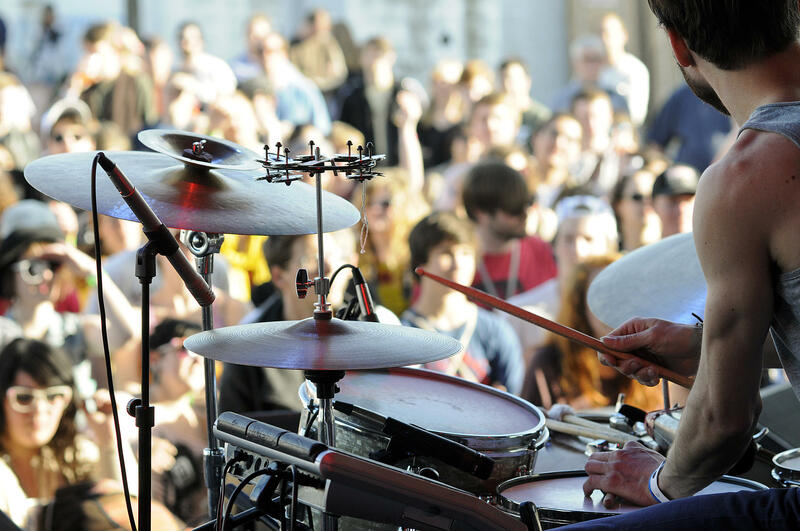 But by being conscious of the size and scope of the festival, Treefort has garnered support from Doug Martsch, the lead singer of Boise’s most famous indie band – Built to Spill. Frankie Barnhill: He says his band’s show at Treefort last year was the most fun he’s ever had playing in Boise. Scott Graf: There are more than 260 bands coming to play at the festival. That’s a lot of music in four days. So what are your top five picks? Frankie Barnhill: Unknown Mortal Orchestra has received a lot of good press lately. I can’t wait to see funk and soul group Sharon Jones & The Dap Kings – I’ve seen them perform before and couldn’t get enough. Last year I missed female rapper phenom K. Flay, and so I won’t miss her this time. I also want to check out one of Built to Spill’s curated shows, and local singer songwriter Grandma Kelsey. Scott Graf: So it’s called Treefort Music Fest. Is there an actual “fort” at Treefort? Where did the name come from? Frankie Barnhill: It turns out that the name was the brainchild of Eric Gilbert. It plays off Fort Boise and the City of Trees – but mostly it’s just a whimsical reference to childhood. Last year there wasn’t a fort to speak of, but I have received confirmation that there will be a treefort-like structure somewhere at the festival this year. Organizers with Boise's Treefort Music Fest released a fresh batch of band names set to play the March event. In a press release detailing the growing linuep, Treefort planners say the Boise-based Built to Spill will play three nights in a row (March 22-24). Boise was treated to a “secret show” at the Neurolux Monday night. Youth Lagoon, also known as Trevor Powers, kicked off his spring tour with an unofficial concert at the downtown venue. If you've been itching to plan your Treefort Music Fest experience, the wait is over. Friday, organizers shared the schedule for the March 21-24 festival. After making a profile here, festival goers can pick and choose bands they simply can't miss. A personalized schedule gets compiled, and friends who also make profiles can then see yours. Organizers say to "stay tuned" for a Treefort app.